During the last 10 years, endometrial intraepithelial carcinoma (EIC) has been identified and recognized as a histologically distinctive lesion that is specifically associated with serous carcinoma of the endometrium (76-80). Serous carcinomas represent one of the second types of endometrial carcinomas. In contrast with endometrioid adeno-carcinoma, these mostly arise from a background of atrophy or polyp rather than hyper-plasia (76-80) and are not epidemiologically related to unopposed estrogen stimulation. 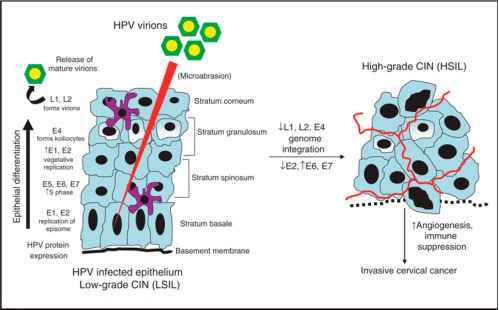 EIC has been proposed to represent a form of intraepithelial tumor characteristic of serous carcinoma, and it is the likely precursor to invasive serous carcinoma. EIC is usually found in the endometrium harboring a serous carcinoma (77,79), but occasionally occurs in the absence of any invasive carcinoma (81). EIC is recognized as replacement of the surface epithelium or of portions of endometrial glands by a layer of malignant-appearing cells, 1-5 cells in thickness. The lesion is often present at a distance of several millimeters from the invasive carcinoma, and is interspersed among atrophic appearing glands or surface epithelium. Papillary tufting of the epithelium occurs in some cases, but a scalloped apical border of lining cells with highly pleomorphic nuclei is more common and most highly characteristic. Overexpression of p53 is found immunohistochemically in the epithelial cells of essentially all cases of both serous carcinoma and EIC, but is generally absent or weakly expressed in endometrioid carcinoma or hyperplasia (82). The histological similarity between EIC and invasive serous carcinoma and the frequent coexistence of EIC with serous carcinoma coupled with shared mutations in the p53 gene provide strong circumstantial evidence of a pathogenetic relationship (77,78). The other highly aggressive histological cell type of endometrial adenocarcinoma is the clear cell carcinoma, the precursor lesion of which has not been defined to date.